Stop wasting time on go-nowhere approaches, lacklustre presentations, unending sales conversations, and failed KPIs. It’s time to take a thorough, planned approach to developing new business opportunities from a highly experienced trainer who wrote the book on business development. Business Development that Works public workshop with Richard Woodward is a one-day intensive that skillfully combines real-world experience with solid theory, using practical, engaging exercises so you can apply what you’re learning, seek feedback, refine and implement immediately. This workshop has been specifically designed for anyone in a business development or sales role who’s serious about improving their results. Richard’s workshops attract business development managers, sales consultants, sponsorship sales executives, corporate sales executives, client services directors, fundraising and marketing directors, who come because they’ve heard of Richard’s stellar reputation as an expert trainer and facilitator who brings real results. Whether you’re seeking to target new accounts or engage new clients, customers, partners or exhibitors, this workshop will build the key skills and knowledge as well as the attitude you need to attract and retain key prospects. Achieving your sales and business targets is crucial to your career advancement and enjoyment of work. But it’s easy to get worn down: too many meetings with indifferent prospects; unending sales processes with low rates of closure; and confusion over which sales and marketing techniques and strategies you should pursue. Richard’s process is based on 30 years’ experience, firstly working in top business development, sales and marketing roles in both the UK and Australia, in organisations including the Commonwealth Bank, KPMG, the Sydney Opera House, Royal Automobile Club, Stadium Australia, and McCarthy & Stone, and for the last 14 years running business development and sales workshops across Australia, the UK and New Zealand for clients who are leading players across corporate, small to medium enterprise, and not-for-profits sectors. Richard’s extensive real-world business experience, as well as his training and facilitation expertise delivered across a wide range of business sectors, ensures that these workshops are evidence-based, steeped in the real world and, most importantly, translate into real results. In just one day, we work through Richard’s Business Development that Works process, which is outlined in his book of the same name. Identifying exactly who you’re seeking to target in your business development takes the guesswork out of research and quickly and easily enables you to get clear on how you’re going to invest your limited time, budget and energy. This is the foundation to your business development success. Together, we develop a clear, compelling and concise value proposition so that you’re better able to attract your ideal clients. You’ll have an invaluable opportunity to refine your all-important elevator pitch in a supportive environment of your peers, with opportunity for direct feedback from Richard. How do you connect your business development actions with your targets? We’ll develop a realistic and robust business development activity plan and delve into how activity targets translate into conversions, so you can focus your time and attention on activities to achieve your targets. We explore the essential ingredients to making your first approach to prospects, the right approach to secure more first meetings. We examine how to amplify your success rate by becoming magnetic to prospects. With so many different marketing methods, we focus on attraction methods that demonstrate your expertise while attracting your best-fit prospects to approach you. How do you ensure that your sales meetings are successful? Learn how to stop leaving money on the table and start making sales meetings efficient, productive, and enjoyable. Building rapport is essential for effective business development and sales. Learn how to systematically build rapport and see how this naturally translates into new sales, repeat sales and recurring revenue for the organisation. We practise questioning and active listening skills so that we’re better able to uncover clients’ and prospects’ needs to improve sales, client outcomes and client satisfaction. Keep your prospect, client and customer at the centre of all you do and you’ll immediately improve your results. Together, we build an argument for why your prospects must choose you over your competitors. Learn how to quickly and easily overcome the most common objections to the sale so that you can improve your close rate. Richard’s five-step system for overcoming objections with prospects is invaluable and pivotal to your success. We’re able to better retain clients when we can keep following through on our promises while providing excellent, responsive customer service. Learn the mindset, tools and techniques for effective client service and retention so you can make real impact on your client attrition rate. The best business development people have a positive, confident, upbeat attitude. So how do you maintain a positive outlook, even through setbacks and rejection? We cover highly effective, science-based techniques to creating a confident, motivated, positive mindset on demand. Plus, you’ll learn how to use your business development experiences to further drive your personal performance. I read the book which I found great. After today I can now apply my learning. The entire process works. Thank you, incredibly beneficial. It was fantastic. Even if you've been in marketing and B.D. this is a valuable session to learn new tactics, plan better and not fall back into bad haibits. Richard's knowledge of business development is evident in every aspect of the workshop. A very beneficial workshop to cover all areas of BD. Tools and techniques I can apply immediately. I am so glad I came across this course on the internet. I highly recommend it. Very engaging workshop which reinforces many techniques you have implemented in your B.D. while highlighting areas for improvement. Excellent presentation - right balance of presenting and practical. Fantastic value, insightful and practical - I highly recommend any workshop with Richard Woodward. Excellent course. Great content and well delivered. Very informative and beneficial to how I will approach my role. Your ideal client profile, to better clarify and focus your business development actions. Your elevator speech - written, practiced and refined. Your business development activity plan, so you know exactly what to do, when and how. Clarity on how to allocate the right amount of time to the right opportunities. Invaluable questioning skills to use throughout your life and career. A repeatable system for developing compelling solutions. A five-step system for overcoming objections. Increased confidence and practical methods to quickly get into the right mindset for business development. How to better retain clients to increase client lifetime spend. The key traits of high performing business developers across all industries and insight into what’s personally holding you back from achieving your goals. This workshop is for anyone whose role encompasses business development. This includes business development managers, sales managers and sales consultants, development managers, sponsorship sales executives, corporate sales executives, client relationship managers, client services directors, fundraising and marketing directors, functions and venue coordinators. Most importantly, it’s for people who are ready and wanting to improve their personal performance in business development and sales. Who is this workshop NOT suitable for? This workshop is not suitable for people working in retail, telesales or multilevel marketing. It’s not relevant for people who are already satisfied with their sales rates and business development results. This workshop is for motivated individuals who are coachable and willing to invest the time to implement workshop materials in order to measure their results. How advanced is this workshop? This workshop caters to a broad range of skill sets and experiences. It assumes some real-world experience in sales, customer service or business development. Will Richard himself be delivering this workshop? Absolutely. Richard delivers all public workshops marketed under the Richard Woodward and Associates brand. For the last 14 years, Richard has personally delivered workshops across all major Australian capital cities, as well as in London and New Zealand. How many workshop participants will there be? Workshop numbers are strictly limited to around 16 participants to make this as valuable, interactive and relevant as possible. This is NOT a workshop where you can get lost in the crowd to quietly doze off or catch up on work. We’ll be putting lessons into practice, reflecting on our experiences by ourselves and with other participants, implementing what we learn and seeking feedback from each other and from Richard. What system or methods will be covered in this workshop? Everything taught and discussed in this workshop comes from the business development systems and sales and marketing methods covered in Richard’s book, Business Development that Works. You are welcome to purchase a copy of the book before the workshop if you’re curious, though all workshop participants receive a copy as part of the ticket price. How does this workshop differ from sales training? Business development incorporates sales but is far broader and more holistic, dovetailing into overall business strategy and including components of marketing and customer service. Sales training covers one facet of business development training and doesn’t take into account ideal client profiling, marketing, customer service or client attraction methods. Who is Richard Woodward and what makes him qualified to lead this workshop? 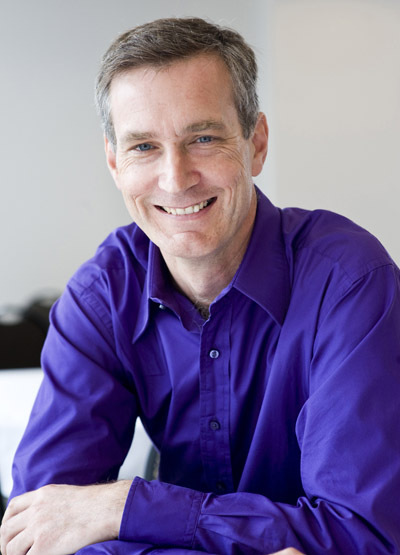 Richard delivers 30 years of real-world business experience and training and facilitation expertise. The was gained in top business development, sales and marketing roles in both the UK and Australia in organisations including Commonwealth Bank, KPMG, the Sydney Opera House, Royal Automobile Club, Stadium Australia, and McCarthy & Stone. Over the last 14 years, Richard has run business development and sales workshops across Australia, the UK and New Zealand. His clients are leading players across corporate, small to medium enterprise and not-for-profits sectors. Like you, Richard works in business development. He spends time researching new opportunities, developing proposals, meeting new prospects and converting them into clients. He will teach you the strategies that have enabled him to secure many leading organisations as his long term clients. His training expertise comes from many years in the trenches and through talking with a wide variety of business leaders dealing with issues that aren’t covered in theory but only earned through many years’ experience. A practical session that highlights sales and business development skills that are essential to your success in Business. Excellent and a good reminder of the multi-faceted approach to Business Development. Lots of useful information from someone who clearly knows what he's talking about. Excellent presentation skills - stayed engaged and attentive the whole day. Venue: The Hyde Park Forum, 271 Elizabeth Street, Sydney. Investment: Book and Pay before March 28: $690 (ex GST); $740 (ex GST) thereafter. Includes: Coffee on arrival, lunch, morning and afternoon tea, course workbook, plus a copy of Richard’s book Business Development That Works. 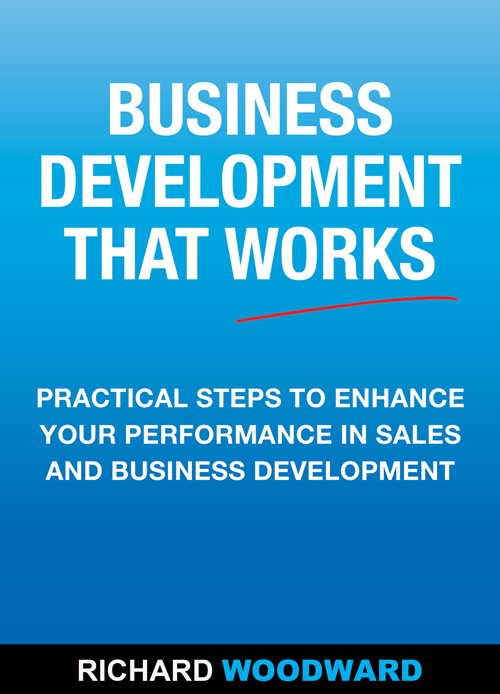 Each workshop participant receives a copy of Richard's book Business Development That Works. Note: Workshop numbers are strictly limited to ensure a low trainer to participant ratio. Subject to availability, a place will be reserved for you at the workshop for 14 days and a tax invoice will be sent to you via email. In the event that the workshop is over subscribed you will have the opportunity to be wait listed. Confirmations: On receipt of full payment within 14 days, your registration will be confirmed via email. Payments received after 14 days cannot be guaranteed registration. Payment must be received prior to workshop attendance. Refunds: Full refunds will be paid where a cancellation of registration is received in writing at least 21 days before the workshop. Within 21 days of the workshop, no refunds will be permitted. Substitution: Substitute delegates will be permitted subject to prior arrangement. Note: Richard Woodward and Associates reserves the right not to accept a registration. It may be necessary for reasons beyond the control of Richard Woodward & Associates to change the date or venue. In the unlikely event of the workshop being cancelled, a full refund will be paid. Workshop numbers are strictly limited to around 16 people and are often over-subscribed.